Attached is a collection of letters, emails and notes that parents and children have written to the Headmaster and staff over the last few years. Please take a moment to read some of these as they truly encapsulate the spirit and ethos of Japari School. From our first visit, last year, to my last visit, this morning, at the what I now call “The Reading Picnic” Japari has made A HUGE LASTING IMPRESSION ON US. This week has been full of activities. Gala/Cricket/Picnic and that is just for Cameron. I see a lot more going on in the school and you guys (and I mean ALL of you) involved in running the school do an AWSOME job. I thought I should just take the time to say THANK YOU. YOU ARE A GODSEND. Please convey my sincerest thanks to the Teachers, Staff and Therapists for all the assistance and personalized attention afforded Natasha Christine George. You have been absolutely professional, dedicated, humane and persevering in helping Natasha to consolidate her skills and a vast improvement is noted. A special thank you to Mrs Labuschagne, Mrs Wright-Scot, Dorothy, Sharmla, Paris and Mrs Kamffer. You should rightly be proud of your School and your Team. We would like to inform you that Edward has been accepted back at St. John’s Preparatory School into Grade 3 as of January 2005. We would like to express our heartfelt thanks for the role Japari has played in enabling his return to a mainstream school. His class teacher, Mrs Finlay, deserves special thanks for the time and effort she has put into Edward and his development, as well as the help she has given us in our assistance of Edward at home. You may be assured that we already have and will promote Japari and the sterling work if does at every appropriate opportunity. Lucia Martinengo was a past pupil at Japari, from 2003-2005. 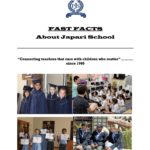 Japari was a fantastic learning institution and really helped Lucia to progress in her school career. She is now the deputy head girl at Brescia House and I do not think that this wonderful achievement would have been possible without having been at Japari. I just thought that you should know about this as it will be “another feather in Japari’s cap”. Thank you for finding the time to meet with me and for sending me an updated report for Mark, your time and concern is really appreciated. I would like to also take this opportunity to thank you and your staff for the wonderful work that has been done for my son. We have been very fortunate to have been able to find a place for Mark in your school and him thriving at your school. This is certainly due to the committed and caring teachers that you have. Mrs Bolle has taken Mark from a struggling student to being one of the top students, (not sure what she has done to his handwriting but is neater than mine). His marks are always really good. Mrs Dale and all the therapists have really worked miracles. Mark’s last reading assessment, prior to Japari, gave him a reading equivalent of around a 5 year old. He is now a fairly proficient reader and is able to read confidently and age appropriately. The change is really incredible. My family has also had the joy of watching your sports teams, mostly the soccer team, and Mrs Wheeler is wonderful with boys. I am proud to watch each boy thank the hosts and play with real heart. I know that it is easy to criticize, but we do not often take the time out to thank and praise. The change that your school and staff have brought to our family is really wonderful. Mark has gone from a frustrated boy to a content child. Once more thanks to you and your team for creating a really special school that we are very proud to be a part of. How does one say thank so that you can understand the greatness of what your school and parents, kids are. I thank you for all the support you have given my family and myself. It brings a lump to my throat. I have been involved in many schools but I have never ever seen a school like yours. I’m not very good at writing and I’m too emotional to speak, but I thank you from the bottom of my hear for EVERYTHING you, your wonderful teachers and parents have done for us. “People who have great things within them have wonderful things in store for them. May your todays and your tomorrows be a beautiful reflection of all that you, your teachers, parents and school are”. I would like to take this opportunity to say how proud we are of Imaara’s progress and our humble gratitude and thanks for the immense support that Imaara has received while at Japari – a great learning institution. We would like to pay our greatest respect and say a BIG thanks to all the teachers (Mrs Brink, Mrs Griesel, Mrs G, Mrs Dalgleish, and Sister Tobin) and all the others in the support/therapy program for their outstanding work and dedication. They have certainly had a positive impact in Imaara’s learning, her experience and her journey. I would also like to thank you, Sharmla, for your wonderful, kind mannerism and support. And finally a huge thanks to Mr Rees – Japari is privileged to have such a terrific leader, guide and role-model. You will always be in our prayers and thoughts. I hereby want to thank you for what you have done for my son. I remember on start of his schooling in grade 2 last year, Keanu had no confidence. He could not read or write one word. Within 10 days he got out of his shell, and within 2 months he could read and write. To us as parents this was a miracle. Keanu became the most confident boy I never before could imagine possible. He loved his teacher and loved to go to school. Thank you, and you will always be spoken about in praise as the miracle workers to my once before troubled child. God Bless you all, and carry on with the wonderful work you do. Thank you for embracing Aryeh in your brilliant educational institution where he has felt secure & nurtured. It has been in your school that he has received compassion & understanding and consequently blossomed into the confident and happy young man that has graduated from grade 7. We are so grateful for the miracle that Japari was the only school that had a space available for Aryeh, at that moment in our lives when we could not see the light. We believe that the strong, ethical values instilled in the core of Japari, of respect for all mankind no matter what religion or race, will take every child that is blessed to be accepted into Japari very far in life. Please accept our gift, a Chanukia, a Jewish symbol of light and revealed miracle. We hope that is will be a beacon of light to all children of different religions that enter your school. We will be forever grateful and want to wish Japari Happy Chanuka and continued success in the future. I would also like to take this opportunity to thank you and Mrs le Roux for the hard work with Josh over the last couple of months! Josh is a different child when it comes to school and homework and it is a pleasure to see that he is doing so well! His reading has also improved so much that is no longer “afraid” to try and read things! Thanks for a GREAT job! My daughter, Michaela Wallace, attended Japari from 2003 t0 2005 in her foundation phase years. I would like to share with you Michaela’s progress as I feel we owe her success in part to the fantastic remedial programme at Japari. Michaela completed her primary schooling at the end of last year at Clarendon Girls School which is rated as the ‘top school in Eastern Cape’ by the Sunday Times survey that is done every year. I am delighted to let you know that Michaela achieved a 71% aggregate for her Grade 7 year-end report in what is most definitely a strong academic school. We are proud of her achievement and it made me think back to those early days in Grade 1 at Japari when we were not so source of what the future would hold for Michaela, but she has really shown us what she can do and that through hard work and determination anything is possible! Michaela has just started at Clarendon Girls High last week and I know that she will continue to give of her best and excel in all that she does. Special thanks to you and your dedicated staff for the role that you played in Michaela’s education. Best wishes to all at Japari. I just wanted to let you know that we were notified yesterday from Kingsmead that Emma has been accepted for Grade 8 for 2010. We are thrilled and relieved all at the same time, and we wanted to thank you and your staff for the time spent evaluating and discussing Emma’s progress with us and assisting with the application process. I would appreciate it if you could let Mrs Labuschagne and Ms Bozzoli also know as they have been a great support to Emma this year. Japari’s ethos and motto of Faith-Vision-Courage have stood us in good stead these last few months! I am Liam Hattingh’s mom. Liam has only been at Japari for a few days, but I have never seen him so happy. He had a really tough year at his previous school, been misunderstood and shouted at everyday by his teacher. Been accepted and taken notice of in Mrs Engels class has already brought the sparkle back to his eye. Please pass on my thanks to her with a copy of this. I have pleasure in informing you that one of your past students Stephan Reussenzehn has recently been appointed a Prefect at Parktown Boys’ High School for the New Year. May I take this opportunity to congratulate you and your staff on the excellent foundations that you gave to him in his primary years. Being appointed a Prefect is the result of many years of character building and leadership development for which you must take much of the credit. Thank you for your updates. They have been very helpful. We have very busy lives, as well as all of the parents. You have made it easier to schedule our day and reduce the stress around the children’s activities. We have enjoyed our time with Japari these last three years. While we are excited about the next phase, I will say that we will miss you all. Thank you for helping us to parent Victor and ensure that he gets on the right path. We are truly grateful! After five happy and rewarding years at Japari, he mainstreamed at St Davids Marist College, Inanda in January 2003. Today we would like to share with you and your staff that Oscar has successfully passed Matric with Univ. pass, which in 1997 we did not think was ever possible. Over the years he learned to live with his dyslexia and developed his skills in Sound & Lighting Engineering. He was awarded double Honours for his service to the school in this field. Oscar also received the prestigious 2007 “Service above Self” award from Sandton Rotary. After the desperation we felt in 1997 when the dyslexia was diagnosed, and the pride we feel now, of what has become of our son, we would like to pass our story on to the Japari parents to let them know that their children are at a great school with very dedicated teachers, who with great love and care build the children’s’ confidence, so they learn to cope with their weaknesses and get a firm grounding for further education. Without Japari, Oscar would not be where he is today ……. Starting a B-Com (entrepreneurship) at UNISA plus a study in Sound Engineering at the SA Academy of Sound Engineering (Auckland Park). It is obvious from this e-mail that Raymond has adjusted extremely well to life in New Zealand and appears to have settled down quickly at school. I am equally delighted to see how well he is doing in Maths (please tell Mrs L) and will be getting coaching with his spelling and English. However, I believe the time he spent with us, and especially at Japari, helped bridge the gap of coming from an Afrikaans speaking household/school to speaking English as well as he does. I personally cannot thank you and your staff enough for all they did for Raymond, especially taking him in under such difficult circumstances and not knowing when he would be leaving. He grew in confidence and for the first time in his life actually enjoyed learning and going to school. He loved Japari and your school will always hold a special place in his heart. Thank you so much for everything and especially the love and support you gave our family during this difficult and trying phase in our lives. Going to school that was a house, or a house that was a school, was always a joke for most of my friends who went to “normal government schools”. This was enough to give any child complexes about where he belonged. But they knew very little about it, that school was not a house but a home. It has more than teachers and children; it had a family. Every family has its problems and this one, just like any family could get through any predicament, be it thick or thin. Nobody knew that at Japari every student had his own identity, his own limits and his own difficulties, but by simply being there for each other, we were able to work through any dilemma. Japari is not only a school that taught me how to read and write, but it also taught me about friendship, loyalty and respect for others and myself. Friends and family warned me that the shift from primary to high school would be difficult. Yet in all honesty I was well prepared due to the steady foundations installed in me by Japari. I was able to adapt to a new routine, work hard for long hours and valued the meaning school spirit. Of course I was unable to comprehend it at the time. Primary school to me then was life’s greatest burden. I did not appreciate the effort and commitment put into me by the Japari staff. But I am now eternally indebted to them for what they have given me. I anyone ever asks me what I am most grateful for, I will answer ……. Being part of the Japari family. It is with great pride that I write this letter. I came to Japari in grade 1, 2001. When I came to you I could hardly read or say my ABC. I was a very introverted little boy, who hardly spoke. I had no confidence in myself but from the first day I left with a smile on my face. At that stage my parents were told that I might never even mainstream, let alone mainstream back to St John’s College. Yet in 2004 I mainstreamed back to St John’s College. When I went to St John’s my parents knew that it would be hard academically but within that year I became captain of the U12 water polo team and the U12 rugby team. The next year I made captain of the prep first team rugby and water polo teams. In college I started to blossom and I continued to be captains of water polo and of my rugby side towards the end of grade 9, I made 1st team water polo! In grade 11 I was voted onto the JCC, the Johannesburg Junior City Council, as Deputy Director of Sports and Recreation, and 3 weeks ago was voted Deputy Head Boy of St John’s College! The purpose of this letter is to give every one hope and encouragement. Yes I do Maths Lit., I need a reader for exams, extra time and spelling concessions, but I am determined to get a matric and a good one at that. Japari gave me 3 things, confidence in myself, the ability to know how to work hard, and the realization, that everyone has some problem, whether they are at Japari or at a mainstream school. My name is Heather McCall. I attended Japari from grade four until grade seven. I now am at St Teresa’s Mercy school and matriculating. Japari is a memory I will always treasure. I did not believe I could attend a mainstream school and doing well in those years but it is possible. I have also been accepted into the Witwatersrand Education University. My plans for next year are to be a teacher for the grades one to three and nursery school. I found that Japari’s teaching helped my spelling and learning techniques. I never felt at any disadvantage to any other student in my grade and have adapted well. It is more than a dream to mainstream and to do well. I have, you can too!